The words assessment and hope are not often used in the same sentence. The mere mention of the word assessment can cause stress and angst. At the Assessment Center we aim to change that visceral reaction. 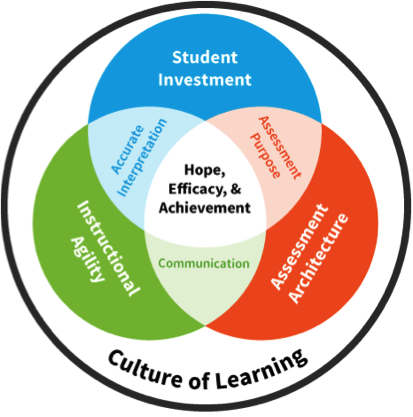 At its core, assessment fosters hope, builds efficacy, and increases achievement (Shepard, 2000; Zimmerman & Schunk, 2011; Brookhart, 2013; Andrade, 2010; Hattie & Timperely, 2007; Brown & Harris, 2013). It is through our assessment practices we create a culture of learning. When we use assessment to show students connections between their work and their learning, there is a shift that takes place—one that helps students understand and experience their work in terms of learning and not only numbers or symbols. Student investment is a symbiotic relationship between assessment and self-regulation. This means that assessment information provides students information on what they are learning. Students know the learning goals and can recognize elements of quality work. When learners develop this type of understanding, they are able to track their progress, reflect on what they are learning and where they need to go next. Learners, when invested, authentically monitor their motivation including what helps them persist and what shuts them down. Assessment architecture is most effective when it is planned, purposeful, and intentionally sequenced in advance of instruction by all of those responsible for the delivery. Assessment Architecture is a blueprint that tightly sequences essential standards; teases out learning targets; identifies the assessments that reflect learning targets; and determines the use of assessments. Assessment architecture is the plan that focuses which assessment information will be used to inform instruction and which will provide evidence to report proficiency. This type of alignment is the building block for teachers to be able to intentionally scaffold for student success. Instructional agility occurs when emerging evidence informs real time modifications within the context of the expected learning. This means teachers respond as they recognize learners’ understanding or misconceptions. Grounded in precision, which is outlined in the assessment architecture, those learning targets that are essential and flexibility guide pacing and instruction and inform adjustments and responses teachers make from observations or student work. The communication of assessment results must generate productive responses from learners and all stakeholders who support them. Learners make assumptions about their learning and their confidence from the assessment information they receive. In the absence of descriptions that tell them what symbols (grades, percentages, check marks, smiley faces) mean in terms of learning, they make up their own interpretations. In order to communicate effectively, our assessment symbols must clearly describe what learners know and where they need to grow. Assessment purposes (formative and summative) must be interdependent to maximize learning and verify achievement. This means assessment must be used intentionally. When we want students to learn and grow, assessment must be used formatively to point out learning strengths and areas for growth. Students, in a formative way, must act on this information to learn more. When assessment information is going to be used as evidence of proficiency or to certify mastery of standards, it is to be used summatively. This evidence is used to communicate levels of mastery on standards at the identified moment in time. The interpretation of assessment results must be accurate, accessible, and reliable. This means the items and tasks in our assessments must accurately reflect the standards on which we are gathering information. These assessment tasks must be accessible to all students, meaning that we don’t want the task itself to get in the way of students being able to demonstrate their current level of achievement. To achieve accurate, accessible and reliable assessments, individuals and teams of teachers must score assessments together and examine student work to determine the extent to which the items and tasks actually offer information on the intended learning target. It is one thing to co-design an assessment; it is quite another to score the assessment in a way that is reliable and accurate. Assessment is an untapped resource in considering the ways it can be used to engage and motivate students to learn and grow. The way we use assessment information can shut learners down or empower them to believe they can achieve at high levels. These six tenets open dialogue and provide a guiding light to implement high quality assessment practices. Come back often and post your ideas, your questions, your dilemmas and your successes. We look forward to learning and growing together in ways that will change the face and reputation of assessment. Andrade, H.L. (2013). Classroom assessment in the context of learning theory and research. In J. H. McMillan (Ed. ), Handbook of research on classroom assessment (pp. 17-34). Thousand Oaks, CA: SAGE. Andrade, H.L. (2010). Students as the definitive source of formative assessment: Academic self-assessment and the self-regulation of learning. In H.L. Andrade & G.J. Cizek, Handbook of formative assessment (pp. 90-105). New York: Routledge. Brookhart, S. M. (2013). Classroom assessment in the context of motivation theory and research. In J. H. McMillan (Ed. ), Handbook of research on classroom assessment (pp. 35-54). Thousand Oaks, CA: SAGE. Brown, G.T.L., & Harris, L.R. (2013). Student Self-Assessment. In J. H. McMillan (Ed. ), Handbook of research on classroom assessment (pp. 367-393). Thousand Oaks, CA: SAGE. Zimmerman, B.J., & Schunk (2011). Self-regulated learning and performance: An introduction and overview. In B.J. Zimmerman & D.H. Schunk (Eds. ), Handbook of self-regulation of learning and performance (pp. 1-12). New York: Routledge.